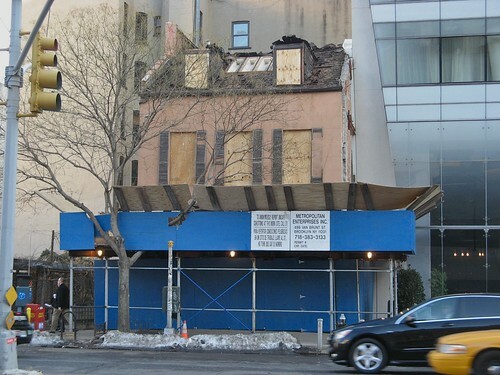 As seen on EV Grieve, the Bowery Alliance of Neighbors and others are circulating a petition to make sure the circa 1818 Federal-style house at 135 Bowery becomes a landmark. An East Villager tells The Post that he thinks Gavin DeGraw is getting preferential treatment from the NYPD— the police have posted fliers in an attempt to find the singer’s attackers. When the news first broke that a new six-story residential building at 427 East 12th Street would be designed by controversial architect Karl Fischer, speculation immediately ensued about its appearance. Now, The Local has obtained a rendering of the building, which is marked by floor-to-ceiling windows and a penthouse that sits two stories above its neighbors. The developer of the building, Shaky Cohen, said that he and Mr. Fischer had strived to make the building fit into the neighborhood. He added that the building will feature a pair of one-bedroom apartments on floors two through five, with the ground floor accommodating an apartment with a backyard, and the top floor a penthouse. The building will also include perks like a virtual doorman and a communal roof deck. But two local preservationists scoffed when they saw Mr. Fischer’s design. Grace Maalouf Kate Daly, executive director of New York’s Landmarks Preservation Commission, speaks earlier tonight at an informational meeting about two new proposed historic districts in the East Village. The Landmarks Preservation Commission presented its plans tonight for creating a historic district in the neighborhood and heard from several community groups who voiced their support for the measure and also suggested extending the districts. 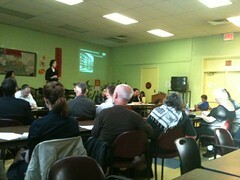 The presentation, which occurred during an informational meeting at the BRC Senior Services Center hosted by Community Board 3, is one of the first in a series of steps that would mean property owners in the designated areas would need commission approval before making changes to their buildings. She added that the commission is “very eager to move forward” in the designation process, and that the two historic districts proposed are just the beginning for the Lower East Side. Grace MaaloufThe Community Synagogue on East 6th Street is one of the significant buildings to be included in the proposed new historic district. As gentrification continues to alter the East Village landscape, attempts are afoot to have sections of the neighborhood designated a historic district, helping to preserve their architecture and character. Following extensive surveying and examining the neighborhood, The NYC Landmarks Preservation Commission recommended at an April 26 meeting that two areas of the East Village be designated historic districts. 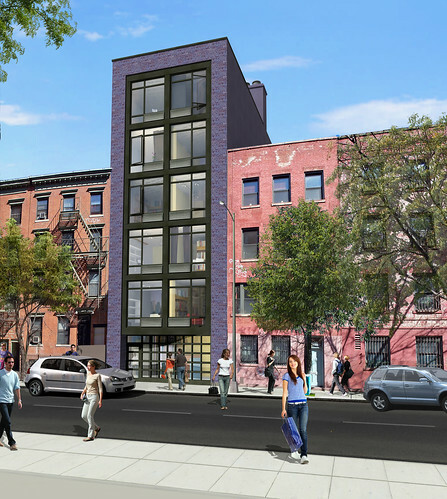 This is a preliminary step in the process, with a follow-up public presentation and hearing before the Landmarks Subcommittee of Community Board 3 on Thursday this week. The two areas slated to constitute this historic district include approximately 300 buildings. One section is the north side of East 10th Street between Avenues A and B, opposite the northern boundary of Tompkins Square Park. This block includes a mix of stately 19th century brownstones along with tenement buildings. 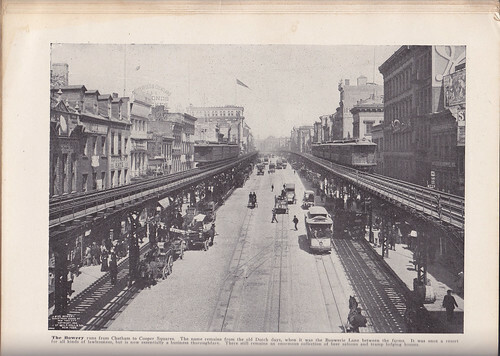 Courtesy of Tim SchreierA photograph of The Bowery in the 19th century showing the elevated railroads. Kerri Culhane’s lightning-speed, three-minute presentation at the Community Board 2 meeting held at Our Lady of Pompeii Church on Monday provided little indication of the vast research she has gathered in seeking to create a Bowery National Historic District which would span the approximately mile-long avenue, which runs from Chatham Square to Cooper Square . Currently, individual buildings on the Bowery including The Bowery Savings Bank and Bouwerie Lane Theater have been designated National Historic Landmarks, along with limited portions of the Bowery being included in already designated National Historic Districts. 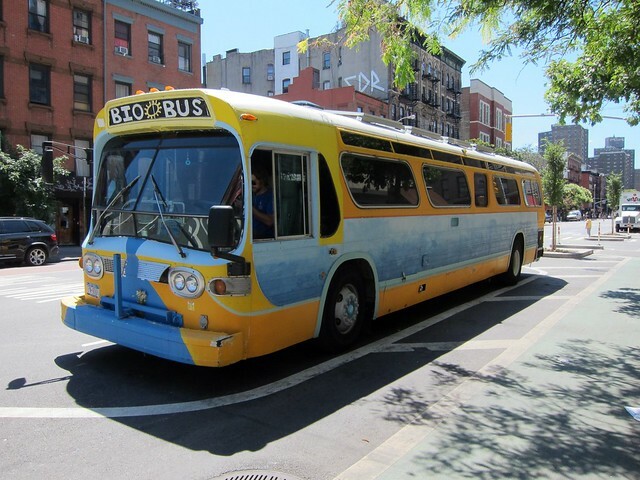 The effort is being co-sponsored by the Bowery Alliance of Neighbors and The Two Bridges Neighborhood Council. Former NYC Landmarks Preservation Commissioner Anthony Tung has described the “disjointed beauty” of the assemblage of buildings which line the former Native American foot path and later road leading to Peter Stuyvesant’s farm or “bouwerie” from which the street took its name. Greg Howard About three dozen demonstrators turned out to protest the planned demolition of historic 35 Cooper Square. 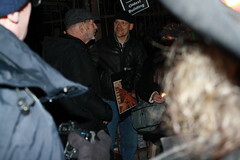 Below: The journalist Pete Hamill (left) speaks with David Mulkins of the Bowery Alliance of Neighbors. 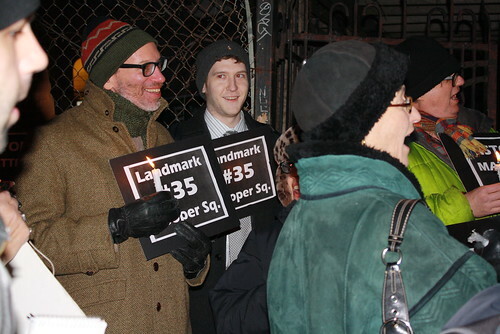 Braving freezing temperatures and acknowledging long odds, about three dozen demonstrators took part in a protest tonight calling for a halt to the planned demolition of 35 Cooper Square. 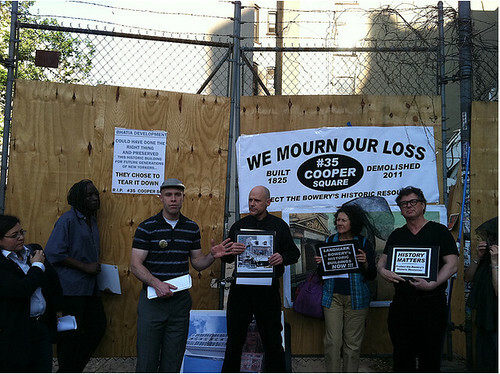 The demonstration, described as a vigil by organizers, represented what preservationists characterized as their last-ditch effort to stop the destruction of the 185-year-old Federal-style structure, which is the oldest building in Cooper Square. After a months-long fight between preservationists and developers of the site, the fate of 35 Cooper Square is all but certain. Nevertheless, protesters tonight brandished picket signs and defiantly chanted “Keep alive 35!” while organizers gave speeches about the historical significance of the site. The sense of community ownership, and of loss, pervaded the atmosphere on the blustery night. David McReynolds, 81, said that he has lived in the East Village for 50 years and has many fond memories of 35 Cooper Square. The journalist Pete Hamill, who’s 75 and a former resident of the East Village, was one of the most recognizable faces at tonight’s protest. 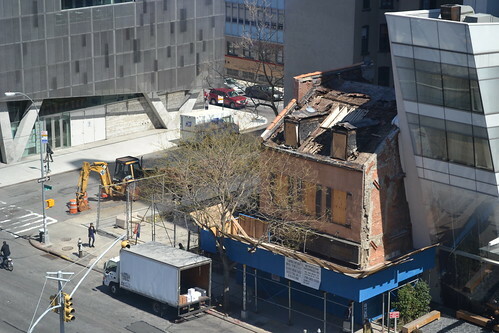 The New York City Department of Buildings posted a full stop work order on a plywood wall that developers recently put up the front of 35 Cooper Square, a nearly 200-year-old federal-style building near the corner of East Sixth Street. The stop work order is dated Feb. 14, the same day that a demolition permit for the building was granted to a developer, Arun Bhatia, and others who own the property. Mr. Bhatia could not immediately be reached for comment. 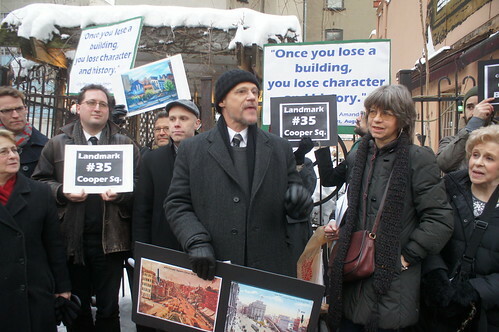 Neighborhood residents, elected officials and conservation advocates had held rallies and circulated petitions in an attempt to convince the Landmarks Preservation Commission to protect the three-story building, which is the oldest structure on Cooper Square. But the commission recently declined to make the building a landmark, saying that its historic façade had been altered. A spokeswoman for Mr. Bhatia has said that he has no firm plans for the building or the site. That form went on to offer additional details, saying that 35 Cooper Square’s roof “has been partially stripped to sheathing and in some cases joists” and is accessible by way of a second floor bar in the Cooper Square Hotel, a recently built high rise. 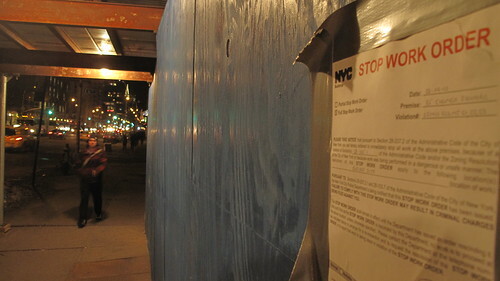 On Tuesday evening several passersby paused to gaze at the stop work order and other documents. Among them was Cynthia Pringle, an arts administrator from Greenpoint who works near Cooper Square. 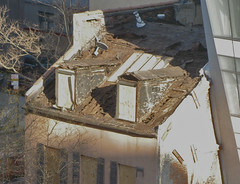 Ms. Pringle, 29, said that she hoped the stop work order would prevent the demolition of the old building. Claire Glass City officials today approved a plan to demolish the historic site at 35 Cooper Square. Below: About 100 people held a demonstration last month to protest planned demolition at the site. Scaffolding has gone up, workers are busy on the roof and an application for full demolition was filed and approved today for 35 Cooper Square. Yet the new owners of the nearly 200-year-old federal-style building that preservation groups are trying desperately to keep standing told The Local three times in the past 10 days that the firm as yet had no concrete plans for the property. Beyond erecting the scaffolding, removing the asbestos, and blocking the windows with wood as a “safety” precaution, there are no definite plans for construction, Jane Crotty told The Local today, speaking for developer Arun Bhatia, one of the new owners. Mr. Bhatia is a partner at Cooper and 6th Property LLC, which owns the building. “I don’t have any word on that,” she said. As for the application for full demolition, Ms. Crotty said, “They’re pursuing their rights to develop the property. The application was filed today.” She confirmed asbestos removal began this past weekend, and is continuing today. “The removal will probably take a couple of days, if not a week.” In conversations on Feb. 4 and Feb. 11, Ms. Crotty had also said there were no definite plans for the site. Over the last several weeks advocacy groups and elected officials have fought to preserve the site. The Bowery Alliance of Neighbors had gathered more than 1,000 signatures for a petition to designate the spot a historic landmark. Now, it would appear, those efforts have been dealt a significant setback. Suzanne Rozdeba David Mulkins, chair of the Bowery Alliance of Neighbors, speaks at a demonstration this evening in support of a landmark designation for 35 Cooper Square. The designation would prevent development at the site. 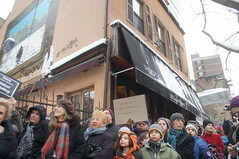 Holding signs that said “Build Memories, Not Luxury Hotels” and “Save Cooper Square’s Oldest Building,” about 100 people, many of them East Village residents, gathered in front of 35 Cooper Square today in a rally supporting the designation of the site as a historic landmark. “We’re here today because this is one of the most significant buildings on this street. 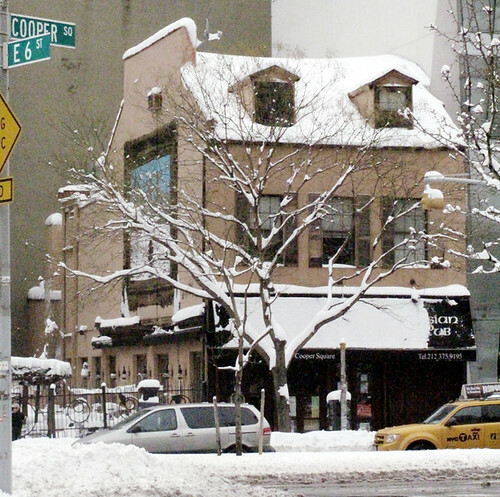 This is the oldest building on Cooper Square. If you lose this building, Cooper Square loses a much earlier sense of its history,” David Mulkins, chair of the Bowery Alliance of Neighbors, which organized the rally, told the crowd, which included a handful of children from The Children’s Aid Society holding a sign that said, “Make 35 Cooper Square a Landmark.” The rally, which started at 4:30 p.m., lasted about 45 minutes. The alliance is circulating a petition asking for supporters to urge the Landmarks Preservation Commission to designate the site as a historic site; more than 700 signatures have been collected so far. The building was sold for $8.5 million in November. 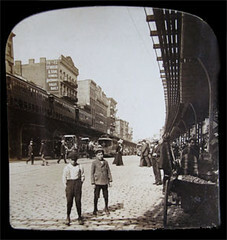 Samantha Ku David Mulkins, chair of the Bowery Alliance of Neighbors, with a 1901 stereoview of the lower Bowery by H.C. White Co. (enlarged below). In a closet off the bedroom of his East Fifth Street apartment, David Mulkins stores a treasure trove of old New York artifacts. Stacks of round film reels, piles of papers, photographs and old entertainment posters compose a shrine to the Bowery from the 1800s to the present. 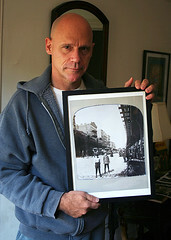 Mr. Mulkins, a high school teacher and 25-year East Village resident, is the chair of the Bowery Alliance of Neighbors, which works to preserve the historic character of the Bowery. 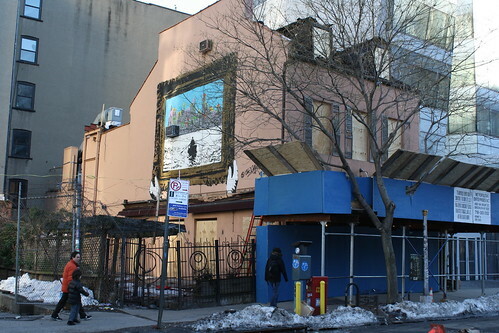 Currently, the Alliance has a two-pronged approach to the Bowery’s preservation. First, it has submitted an application to have the Bowery included on the National Register of Historic Places. Owners of specific historical buildings would be eligible for tax credits and grants from the state and the city. However, it is not seeking landmark designation from the New York City Landmarks Preservation Commission, which comes with a variety of restrictions, said Mr. Mulkins.